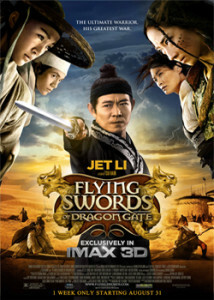 An explosive mix of warriors, fugitives and assassins converge in the desert for a deadly showdown in this multi-award winning, martial arts epic reuniting genre master Tsui Hark with Jet Li in an action-packed, visually breathtaking IMAX 3D experience. The tale continues at the infamous Dragon Inn three years after it was left in ruins. A new gang has taken control of the inn as they secretly search for the nearby lost city of gold. Threatening to expose their search is the arrival of a beautiful fugitive from the palace accompanied by the swordsman who would die to protect her, and a group of assassins who will stop at nothing to find her.